Local journalist, veteran anchor, mom, and Omaha-area resident Brandi Petersen has returned to TV to host Go! Omaha (go.coxmedia.com/GoOmaha). Produced locally by Cox, Go! Omaha showcases the community’s best places to eat, shop, play, and take your family, as well as highlighting unique Omaha resources. In its first edition, which premiered November 12, Petersen took viewers behind the scenes at Baxter Arena, with insights on competition and preparation from UNO Mavericks hockey coach Mike Gabinet; provided information about One World Community Health Center, which ranks in the top 2% of such facilities in the country; recapped Get Started, a local pitching competition for start-up entrepreneurs; and illustrated the unique retail and service landscape at one of the community’s original start ups, the now established but always evolving Nebraska Furniture Mart. The Go! 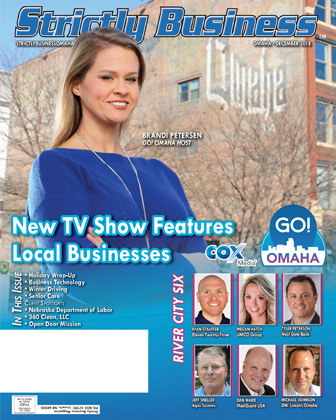 Omaha show concept was the brainchild of a diverse and talented team at Cox Media Omaha. Go! Omaha will air a new show monthly on Cox Channel 1013. It can be seen Mondays at 7:30 p.m., Tuesdays at 6:30 p.m., Saturdays at 11 a.m., and Sundays at 6 p.m. It is also available anytime On Demand. Cox Channel 1013 is more broadly known as Yurview, a channel with the best of local, regional, and national broadcast, live streaming and digital content. Yurview produces and airs Emmy award-winning sports coverage, as well as original programming that covers the outdoors, entertainment, arts, events, people, business, news and more. Cox Media is a division of Cox Communications, the third largest telecommunications provider in the United States. In 1993, Cox Communications began offering telecommunication services to businesses, which eventually grew into Cox Business. Currently, Cox Business is focused on offering video, data, data transport, security, Wi-Fi and managed solution services to small, midmarket, large local, and wholesale companies. The media team works closely with local businesses to find creative ways to reach their customers. They strive to develop and support various initiatives that impact people’s lives, with a critical focus on youth and education, diversity, and environmental issues. Diversity is a key component of the business operations at Cox Communications. Their team works hard to build an inclusive culture in which everyone values the perspectives, needs, and priorities of all people. This commitment also includes a focus on ensuring that people from all backgrounds are included and represented in their business. Cox is known for its pioneering efforts in cable telephone and commercial services, industry-leading customer care, and its outstanding workplaces. To learn more about highlighting your business or organization on an upcoming episode of Go! Omaha, visit go.coxmedia.com/GoOmaha.